Abnormal brain development in high-risk infants who develop autism may be detected as early as age 6 months — before the appearance of autism symptoms. Autism is typically diagnosed around the age of 2 or 3. Research suggests that the symptoms of autism — problems with communication, social interaction and behavior — can improve with early intervention. “For the first time, we have an encouraging finding that enables the possibility of developing autism risk biomarkers prior to the appearance of symptoms, and in advance of our current ability to diagnose autism,” says co-investigator Dr. Alan Evans at the Montreal Neurological Institute and Hospital — the Neuro, McGill University, which is the Data Coordinating Centre for the study. The study followed 92 infants from 6 months to age 2. All were considered at high risk for autism, as they had older siblings with the developmental disorder. Each infant had a special type of MRI scan, known as diffusion tensor imaging, at 6 months and a behavioral assessment at 24 months. The majority also had additional scans at either or both 12 and 24 months. At 24 months, 30% of infants in the study were diagnosed with autism. White matter tract development for 12 of the 15 tracts examined differed significantly between the infants that developed autism and those who did not. Researchers evaluated fractional anisotropy (FA), a measure of white matter organization based on the movement of water through tissue. Differences in FA values were greatest at 6 and 24 months. 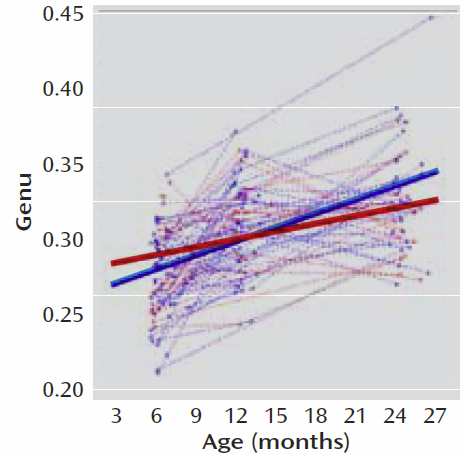 Early in the study, infants who developed autism showed elevated FA values along these tracts, which decreased over time, so that by 24 months autistic infants had lower FA values than infants without autism. The study characterizes the dynamic age-related brain and behavior changes underlying autism — vital for developing tools to aid autistic children and their families. 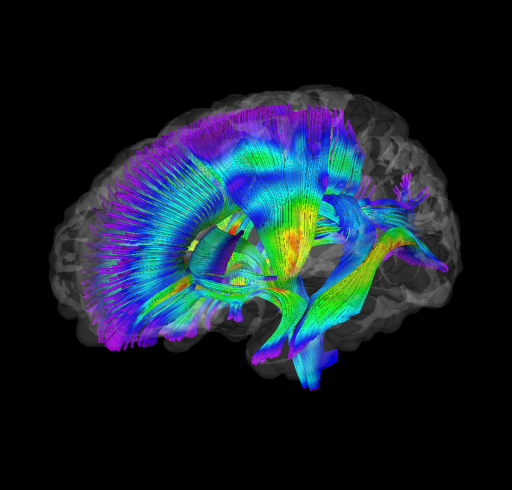 This is the latest finding from the on-going Infant Brain Imaging Study (IBIS), which is funded by the National Institutes of Health (NIH) and brings together the expertise of a network of researchers from institutes across North America. The IBIS study is headquartered at the University of North Carolina, and The Neuro is the Data Coordinating Centre where all IBIS data is centralized.